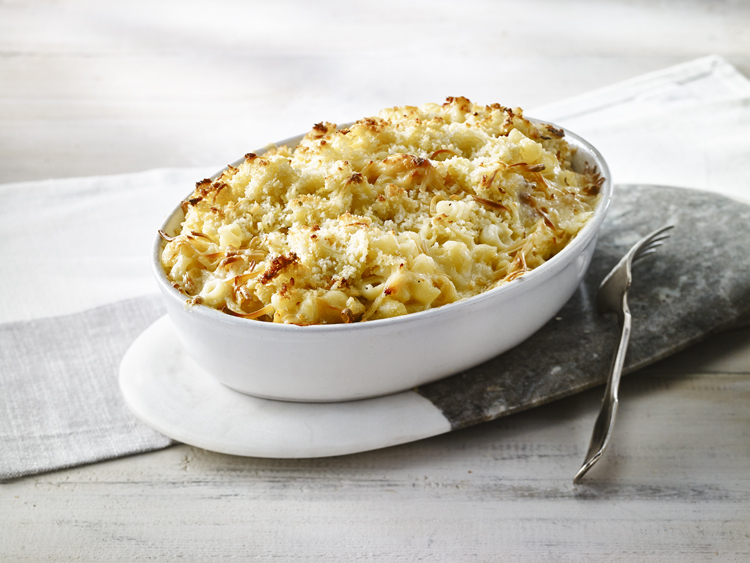 This easy gourmet macaroni and cheese is a favourite! The sweetness of the apples and addition of the sharp beer really add a new dimension. You can fancy it up even further by adding your morning’s leftover bacon! In large pot, melt butter on medium-high heat. Add flour and bay leaf and whisk until smooth; cook for 2 minutes or until golden brown. Whish in milk in a slow steady stream. Whisk until smooth; bring to boil. Reduce heat and simmer, whisking constantly, until thick enough to coat spoon, about 8 to 12 minutes. Turn off heat. Whish crème fraiche, beer, mustard, salt and nutmeg. Remove and discard bay leaf. Pasta Apple Cheese Layer: In large pot of boiling, salted water, cook pasta 3 minutes under the package directions. Drain and rinse lightly. Set aside. Meanwhile, in medium skillet, melt butter on medium heat. Add apples and any accumulated juices; sauté until soft, about 2 minutes. In small bowl. Combine breadcrumbs and oil; set aside. Spread one-half of the pasta in 13×9-inch (3 L) glass baking dish. Pour one half of the sauce, top with one-half each of the Cheddar, Muenster, Five Brothers. Smoked Gouda and Raclette chesses. Top with one-half of the apples and stir lightly. Repeat with remaining pasta, sauce, cheeses and apples; stir lightly. Sprinkle evenly with reserved breadcrumb mixture on top. Place baking dish on a rimmed baking sheet. Bake uncovered until hot, breadcrumbs are light golden brown and edges are bubbling, about 45 minutes. Let stand for 5 minutes. Enjoy! This recipe was provided by Chef Nicole Gomes, Executive Chef of Nicole Gourmet in Calgary, AB in partnership with The Grate Canadian Cheese Cook-Off.